alt-text: NASCAR removed the passenger seats because the drivers hated how astronauts kept riding with them and saying "Ahh, what a nice relaxing drive" . <-- or something close to that. I bet I screwed up the fristpost rules. Just wondering why there are no points on this graph for LHC collisions. And no points for collsions between personal worldview and reality. Last edited by cellocgw on Fri Jul 01, 2016 2:47 pm UTC, edited 1 time in total. Re: 1701: "Speed and Danger"
Four points on a graph! Best exkayseedee yet! So... how controversial is Randall being by marking Formula 1 as faster and more dangerous than NASCAR? Regarding fan feelings, rather than actual hard data? finity wrote: Four points on a graph! Best exkayseedee yet! It's a shame. Where's the particle accelerator collisions, like cellocgw said? Where's the stock market (UK's for extra *)? Where's the pineapple? I'm eagerly awaiting the XKCDSWBs. *what-you-call-it-when-something-references-the-current-situation-ness... please help me out, (gender-unspecific) guys. I'm a little disappointed not to find a Tesla joke somewhere in there. May be it is a very meta joke about Tesla. like, it's too safe to be displayed. idk. I'm honestly confused. Ego wrote: May be it is a very meta joke about Tesla. like, it's too safe to be displayed. idk. I'm honestly confused. Maybe it's "too soon"...in both sense of the phrase. I feel like examples in each quadrant are required. Slow and dangerous: Continental plates. Echo244 wrote: So... how controversial is Randall being by marking Formula 1 as faster and more dangerous than NASCAR? Regarding fan feelings, rather than actual hard data? I think it's factually wrong that F1 is faster. F1 does road courses and a lot of street circuits. To generate the downforce required for high-speed handling, the cars have lots of aerodynamic features (e.g. wings) which create a huge amount of drag and make drafting nearly impossible. NASCAR is oval racing with banked tracks (mostly). Drafting is advantageous and no one is braking to take a hairpin at 100 kph. As far as danger, it's a toss-up. Top tier motor sports kill someone regularly, although it's a lot safer now than it's ever been. As soon as F1 goes closed-cockpit or mandates some scheme fro deflecting debris away from the driver's head, it will be the safer sport. I also think driving a personal car on public streets should have made the chart. Slower than racing but likely way more dangerous. After some quick googling, NASCAR top speed is about 217 MPH, F1 is about 230 MPH. Danger wise, I have no clue, I suppose one could scale based on accident and/or fatality rates per miles raced or # of events raced. The real mind blower is to compare pit stops in NASCAR vs F1. As a 'merican used to seeing the frantic NASCAR stops (where the ratio of pit crew to lugnuts is 1:4) it's amazing to see an F1 stop (where the ratio is something like 20:1). Lame and frustrating comic, especially coming from Randall. We all know what the guy could have done with the basic permise of this comic, had he decided to put even a miniscule amount of effort into it. Right? Oh well. At least the alt-text was genuinely funny. Shouldn't NASCAR and formula one be in the top right quadrant for fast and safe? The last (several) times something like this happened, Randall uploaded the wrong comic and the problem was remedied later in the day. But it's well past noon EST now. This bodes poorly. Every other graph-based xkcd comic has featured numerous suggestions for what Randall "missed". He just left plenty of room for us this time. Maybe the humour is supposed to come from the circumstance that ordinarily, one might expect the three data points "Normal sports", "Nascar" and "Formula One" to be spread out over the scope of a graph like this, but adding "Rocket launches" makes the other three huddle close together in one corner. I agree that the joke seems to be a rather weak one this time, though. Not sure about marshalls/etc for NASCAR/IndyCar, as I mostly follow F1. richP wrote: The real mind blower is to compare pit stops in NASCAR vs F1. As a 'merican used to seeing the frantic NASCAR stops (where the ratio of pit crew to lugnuts is 1:4) it's amazing to see an F1 stop (where the ratio is something like 20:1). I'm pretty sure that if you introduce that much rocket fuel to ANY sport it will be just as dangerous. Quizatzhaderac wrote: I feel like examples in each quadrant are required. Four points on a graph? Two empty quadrants? Lazy. svenman wrote: Maybe the humour is supposed to come from the circumstance that ordinarily, one might expect the three data points "Normal sports", "Nascar" and "Formula One" to be spread out over the scope of a graph like this, but adding "Rocket launches" makes the other three huddle close together in one corner. That's the point I took away. 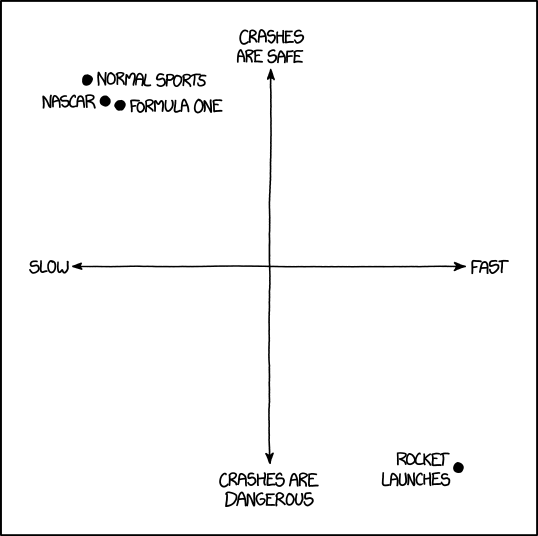 Only by including rocket launches can auto racing be in the slow/safe quadrant and cluster with curling. It plays with the childhood expectation that the axes intersect at (0,0). cellocgw wrote: And no points for collsions between personal worldview and reality. That's off the chart to the lower right. If the scale of safe-to-dangerous is a measure of the likelihood of fatality, then in fairness I should point out that I was once driving at about 100kph on the highway and smacked into a moth that proceded to cling onto the windshield wiper for maybe fifteen minutes until I finally came to a stop, where it flew off on its own ability. As they (more or less) say, drop a mouse down a mineshaft and after he lands he often gets up and scampers off. Drop a man down a mineshaft, he will probably break many bones, and other severe to fatal injuries. Drop a horse down a mineshaft and it will splash. Yeah, astronauts are arseholes like that. Like brain surgeons. Rocket scientists, on the other hand, are nice. There is an x such that x entirely fails to signify just in case x lacks a specific combination of rotary and reciprocating motion. javalsu wrote: Shouldn't NASCAR and formula one be in the top right quadrant for fast and safe? It kind of depends on your definition of "fast." To someone racing a street-legal car down the Old Mountain Road in Misfile, 80 mph or 36 m/s is very fast. To someone flying a T1 Chipmunk, 180 mph or 80 m/s is just about fast enough to start a stall turn. Formula 1 at 230 mph is about 103 m/s. To someone in a photo-recon Spitfire, 360 mph or 161 m/s is a reasonable sort of speed to be doing. To the pilot of an airliner at 30,000 ft, that's slow ... but 360 mph on landing approach is suicidal. .45 ACP pistol bullets and .177 air rifle pellets come out around 250 m/s. 9x19 mm tends to do something more like 450 m/s out of the muzzle. 5.56x45 mm can be 700 to 1000 m/s, depending on barrel length. When you get into orbital physics and asteroid and comet impacts, numbers like 51 km/s start appearing. Even then, "0.5 m v^2" is a good enough approximation so we can call a 10 km/s satellite collision 100 times faster and thus 10,000 times more energetic than a 100 m/s car collision with the same masses involved. That's a difference like "stepping off a 10cm kerb unexpectedly" versus "stepping off a kilometre-high cliff." Is that a lin or log speed axis, though? Where's the 0? Where are the units? What are the units? Somewhere low down and off to the left, possibly way off-image to the left, ought to be the blob for "skiing down the Vallee Blanche / Glacier du Geant and Mer De Glace," because mistakes there can result in your grandchildren coming out to collect your remains 30 years later. It's off to the lower left for some people. I think Randall is restricting things to stuff people do. If we're going to have non-vehicle examples (yeah, I suppose you could argue that a continent is a large, slow vehicle, but I wouldn't), you can then add things like the black hole mergers recently detected by gravity telescopes - where BHs of many solar masses accelerate in speed by a substantial fraction of 'c' in a fraction of a second. That pushes almost everything else to the top left corner. Not necessarily. If you use a geometric scale with continental drift as the low end and c as the upper end, the middle position is about 1 cm/s, and everything reasonable is pushed into the left half of the right-hand quadrants. Come to that, photons hit at (give or take your described point of 'collision', upper atmosphere or solid/liquid surface) the speed of light and either those collisions or the lack of those collisions could be deemed dangerous, depending on circumstances. Since when are rocket launches fast? I guess it depends on how we define "launch". A Saturn V rocket is about as fast as an ordinary car on a highway, when it clears the tower. I feel like the alt text is just an unattributed Mitch Hedberg nod..
Naw, just a similar joke less well delivered. Generally when I hear "rocket launch" I think of the portion from liftoff all the way until the engines are shut off in orbit. 17,500 MPH is what I would call fast. Also, the Titan II carrying up the Gemini missions had a max acceleration of around 6G. That's enough to go from 0 to 60 MPH in just under half a second. I call that fast too. Cars (including NASCAR and Formula 1) are limited to a bit over 1G of acceleration due to the limitations of friction between tires and the road. At high speeds, you can get as much as 3 G from the downforce in a formula 1, but at that point you'll have too much air resistance to get much forward acceleration. Airshows/ Air Races could easily have been included ; would have been near bottom center. Thanks, topicality sounds like it is what I mean.